COMPANY PROFILE Dish TV India Ltd provides direct-to-home and teleport services. It also sells advertising as well as leases and sells digital signal receiving equipment, such as set-top-boxes and dish antenna. DishTV provides direct-to-home and teleport services as part of the Indian media conglomerate Zee Group. DishTV generates most of its revenue by selling direct-to-home subscriptions, most of which are prepaid. DishTV also sells advertising and leases and sells digital signal receiving equipment, such as set-top-boxes and dish antenna. Another source of revenue is from broadcasters paying bandwidth fees to keep content on a prime band. The company generates the vast majority of revenue in India. 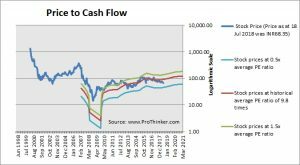 At the price of INR68.35 as at 18 Jul 2018, Dish Tv India Ltd is trading at a Price to Cash Flow Ratio of 7.3 times last 12 months cash flow. 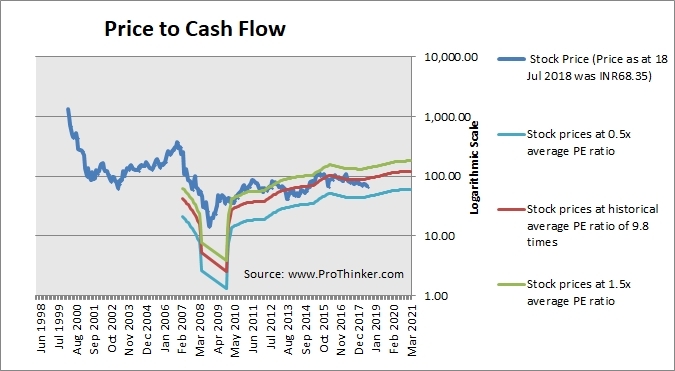 This is a 25.0% discount to its historical average Price to Cash Flow Ratio of 9.8 times.